Welcome to PatioMate – today we’re going to be reviewing the Fire Mountain 2KW Electric Halogen Parasol Heater with fold-able arms. If you’re looking for a standalone heater. You’re in the wrong place! Fire Mountain have introduced a entry level range electric heater with fold-able arms that attaches to your existing parasol. This parasol heater offers comfort, warmth and style without adding a separate heater elsewhere on your patio or outside space. These heaters are ideal for those looking to save space, or if you’re trying to achieve a minimalist look. 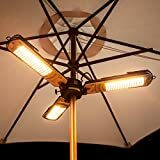 This parasol heater covers will heat up to 16 metres squared. This is due to the large wing span of each individual heater. Most table-top or parasol heaters cover 9-12sqm, so if you’re looking for a heater for larger bar tables, or 6 piece plus sets, this heater is perfect for you! These halogen bulbs last up to 5000 hours. There are two power settings on this heater – 1000W / 2000W. Great for both summer and winter use. The power cord provided is 3 metres long. This is an ample length for most users, but make sure you’ve got a power socket nearby. This solid yet compact heater is 1 metre wide when the arms are extended. It is visually appealing and provides an immense amount of light when on, negating the need for further outdoor lighting. It also folds up when not in use, which helps keeps the spiders away! A powerful all around heater that doesn’t take up too much space, at a mere 8.5cm tall and 5kg in weight, you’ll find that most parasols will be able to accommodate this heater without any trouble. Perfect for both commercial and home users and even better in clubs, pubs and restaurants! Before electricity this heater will cost you approximately £0.016 per hour to run. Which is on par with other heaters in this price range. When we’re looking at patio heaters, most consumers want a fast heating, cost-effective solution. One that doesn’t break the bank but offers style and affordability. The Fire Mountain uses 2000W per hour to run (although it does have a 1000W setting). The average cost per kWh in the U.K is currently 12.2 pence. So to calculate the hourly usage we do the following. Assuming we use the parasol heater for 2 hours a night every night. On full power (2kW or 2000W) our monthly electric bill will be £14.46. If we were to use the economy setting (1kW or 1000W), then it would cost us £7.23 per month. So while this isn’t the cheapest heater to run, it’ll still be somewhat cheaper than gas! You can read more on patio heater running costs here. It does the job. Well priced around the £75-85 range when you can get it. We really like this heater from Fire Mountain. There are other parasol or umbrella mounted heaters, but this is one of the cheaper halogen heaters. As it offers both a 1000W & 2000W setting it can be quite economical to run. We’ve given it a 4 out of 5 stars as we really would have liked to see a remote control or timer function at this price point!